SWPS Fun Photo Booths are based in Plymouth and we offer the latest in the fun photo booth concept, the Magic Mirror Photo Booth is available for hire through-out Devon and Cornwall, our Photo Booth is great for weddings, events and parties. "THE MAGIC MIRROR PHOTO BOOTH"
This glamorous selfie mirror captures full-length photos using an interactive reflective touch screen; it’s pre-loaded with animations and sounds to make using the mirror a fun experience. Strike a pose then customise your pictures using the on screen paint pad. The Magic Photo Mirror is an attraction for all events, and is extremely popular at weddings. 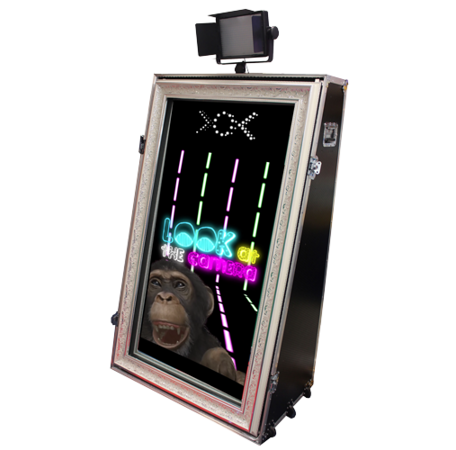 Unlike a traditional photo booth, you can interact with this full-length touch screen mirror to take single or multiple photos. Your pictures are printed in less than 10 seconds. We specialise in providing the 'WOW' factor at your event and with the very best level of service you would expect from one of the market leaders in photography services. If you are looking for something different that will take your wedding, party or event to the next level you need look no further. Perfect for all occasions Birthdays, Weddings, Parties, Events, Corporate Events, Engagements, Celebrations, Christenings, Indoor and Outdoor Events.